NIOS DELED has published the date sheet for the 3rd Public examination of the Un trained In-Service teachers. The organisation will conduct the examinations of courses with course code 506 & 507 in the month of December. 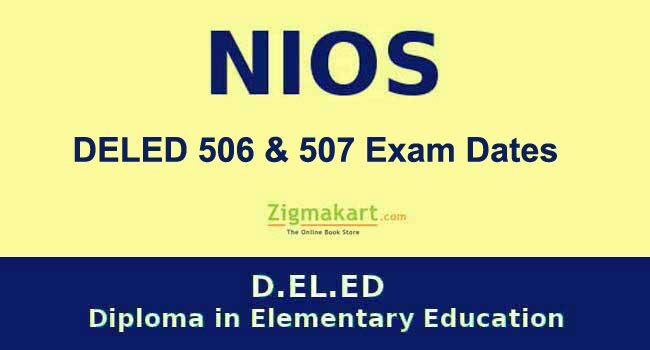 The official notification about NIOS DELED 506 507 Exam Date can be downloaded online from NIOS official website. The Untrained In-Service teachers who are pursuing this programme are looking for NIOS DELED 3rd exam date sheet 2018 online. Their search has come to an end now. This is a good news for all of those candidates that the exam dates are out now. They can schedule their exam preparation now . The date sheet for 506 and 507 courses has been published by the university on its official website. Now, the applicants who have filled up examination form can plan their exam preparation. Below, we are going to mention the exam dates of NIOS DELED 506 and 507 courses one by one. But before that we want to let you know that, please do not believe on fake news about exam dates. For last one month, the applicants are searching on the internet for their time table but there were no clear notification by National Institute of Schooling about it. Many sites were providing the fake exam dates. For the convenience of Untrained teachers who have filled up NIOS DELED exam form, we have provided the direct link of the official notification below where you can check the exam dates. The hall ticket of NIOS DELED 3rd examination (506 & 507) will be available on the official website one week before the date of examination.